Lighting design is an important consideration in the interior design of commercial spaces. The right lighting sets the mood and can create a relaxed and positive experience. At Edison we understand the complexities of lighting and have worked with many architects, designers and shopfitters to offer the right solution for projects all around the globe. Edison’s manufacturing capabilities and quick turnaround times make it the perfect point of call for bespoke projects. Acting as a middleman between designer and shopfitter, our expertise across both fields enables a smooth transition from plan to install. 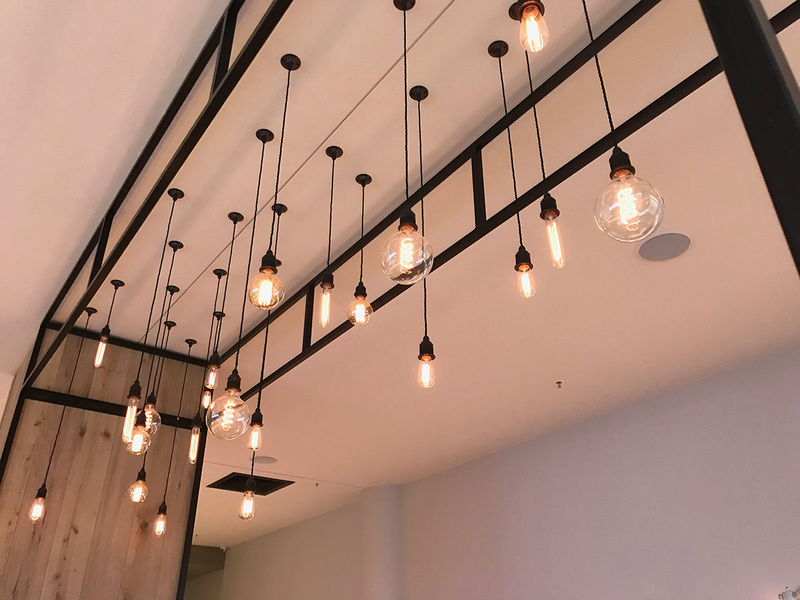 The Hudson Coffee franchise is a great example of where we have worked with the designer to translate and custom a lighting design that has then been rolled out to a number of locations. In 2009 Hudsons Coffee was acquired by Emirates Leisure Retail Australia (ELRA), part of the high profile Emirates Group. Their aim was to take Hudsons Coffee into a new phase of domestic growth with a focus on franchising. Part of this strategy required a total rebrand of the business. The challenge, to create a brand that had the warmth of a local coffee shop but was translatable nationally and, potentially, internationally. ELRA engaged design firm Hoyne Design to undertake the rebrand project. The aim was to shift consumer mindset to associate the brand with quality and perfection. The brand’s image and in store design, had to express warmth, comfort and familiarity but be capable of a national roll-out and translatable across various franchisees. The result was a new look, incorporating handwriting, soft ambient lighting, hand-painted graphic panels and a natural material palette. The use of our dark bronze hardware, black pulley cord and LED filament globes were chosen to work back with the modern clean aesthetic of blond wood, white subway tiles and black steel work. The end result is a contemporary yet timeless interior which feels like a trendy local coffee shop. With our comprehensive catalogue listed on our webshop along with detailed specifications we make it easy for architects and designers to specify appropriate lighting for their projects. Our onsite workshop enables clients to customise products to suit a design fit-out. If an off the shelf product cannot be found from our extensive range we can vary an existing product or even prototype a design from scratch. Contact us to discuss your next project.